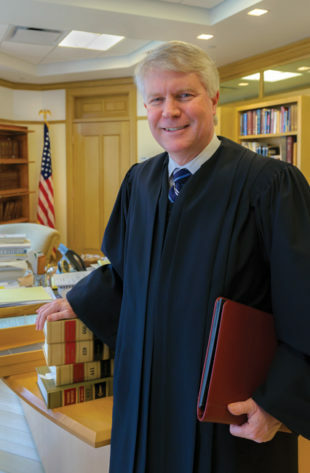 The chambers of United States Court of Appeals Judge David F. Hamilton are like no other. 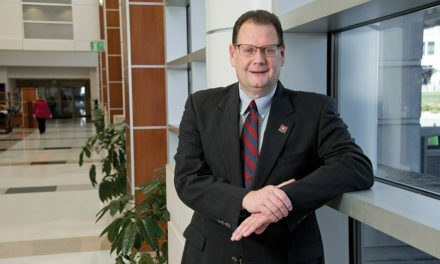 The Court of Appeals ranks only below the Supreme Court as the highest court in the U.S. judiciary, and Hamilton’s suite in the Maurer School of Law at Indiana University is the only federal appeals court office in the country located on a college campus. The arrangement has multiple benefits for the 7th Circuit Court judge, his staff, and the university. It spares Hamilton, who was President Barack Obama’s first judicial appointment in March 2009, the commute from his Bloomington-area home to Indianapolis, where he typically would establish his office, and where from 1994 to 2009 he served as a judge in the U.S. District Court for the Southern District of Indiana. “The clerks and I participate a great deal in the life of the law school,” Hamilton says. “Conferences, lectures, various events. My law clerks get involved with things like helping out with moot court. And I make some guest appearances in classes.” Hamilton also has discussions almost daily with the law school faculty, not about specific cases, but about various areas of law in which the professors are experts. The 11 active judges on the 7th Circuit consider about 1,000 cases a year that originate in Indiana, Illinois, and Wisconsin, and for nearly all of them the court’s decision is final. Only about five cases a year ever move on to the Supreme Court. Hamilton travels to the court headquarters in Chicago every couple of weeks for business he can’t complete in Bloomington. Most cases are resolved by teams of three judges. It’s rare that the court meets with all judges present. Hamilton is a Bloomington native whose father, Richard, was the first minister at St. Mark’s United Methodist Church when it was founded in 1954. Hamilton grew up in Elm Heights, learned to play tennis at Bryan Park, and went on to earn degrees at Haverford College and Yale Law School. Hamilton also is the nephew of Lee Hamilton, the 17-term Indiana congressman.